If there’s one thing I’ve learned just from strolling around, it’s that Japan does holidays well. During the long stretch of time between Halloween and New Year’s Day, store decorations, events, celebrations, and holiday spirit characterize most of Tokyo. 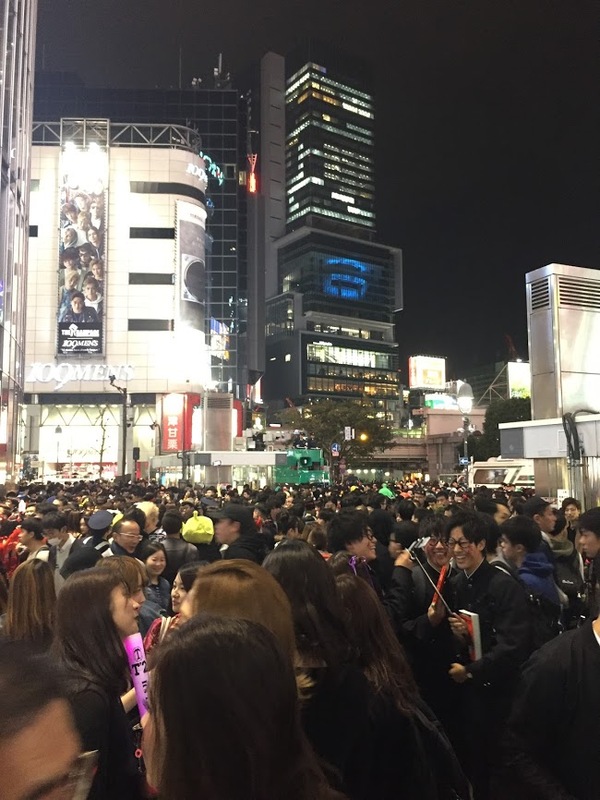 On Halloween night, I went out with some friends to Shibuya, an area of Tokyo famous for its scramble crosswalk (where at peak times, if you start crossing holding hands with someone, it doesn’t seem unlikely that you’ll end up with someone else at the other side!). That night, so many people (a good number in costumes too) filled the streets and sidewalks that multiple policemen had to help direct traffic. Walking the short distance from the subway station to the intersection to the opposite sidewalk seemed to take upwards of 10 minutes. As various individuals in chicken costumes likely demonstrated, crossing the road to get to the other side is not all it’s cracked up to be in Shibuya. Despite the hectic environment, there still remained a paradoxical sense of orderly chaos that is often associated with Japan (re: queueing for crowded subway trains). While most people seemed super eager and in the Halloween spirit, it never felt too uncomfortable or crazy in the crowd – no hasty mass scramble across the street or deliberate shoving; just a fairly slow-paced albeit cramped stroll. Overall, the experience was bearable, and seeing people’s elaborate costumes made my night – the best costumes of the night in my opinion belonged to two individuals dressed up as the Phantom and Christine from Phantom of the Opera. In November, while Thanksgiving isn’t widely celebrated here, the students and staff from my study abroad program held a Thanksgiving party to bring a touch of American culture into the holiday season. Though we weren’t able to procure a turkey, the warm and familial environment felt comfortable and nostalgic. And now, during the period of Christmas and New Year’s, the Japanese holiday spirit remains on full display. Holiday lights decorate streets, department stores, and parks throughout the city, with plenty of Christmas trees and holiday décor visible through windows. Convenience stores and malls play calm Western Christmas music, forming a nice nostalgic ambience. Tokyo Tower puts on a special light show throughout the month featuring a heart illumination that only appears for a short duration at night. While these holiday traditions may seem familiar, one Christmas tradition in Japan may always seem a little strange – eating KFC. News articles usually pop up every December detailing Japan’s unique tradition of having fried chicken from KFC as a Christmas meal. Special Christmas KFC meal buckets are often pre-ordered months in advance, though long lines of individuals and families still form on Christmas Eve and Christmas Day. While I ended up deciding to forgo this particular tradition, I’ve still been able to get a taste of the holiday spirit through holiday markets and special displays. Japanese holiday seasons never fail to impress. 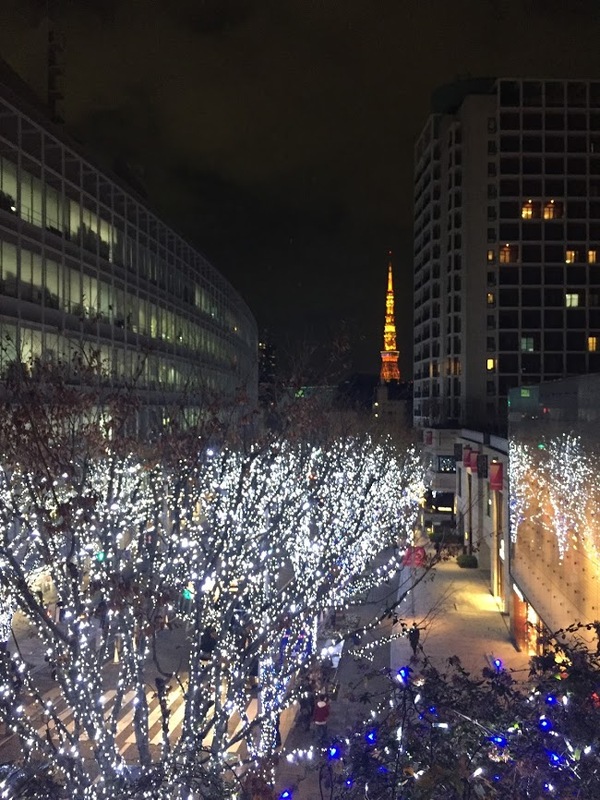 While the current holiday period may be ending soon with the arrival of 2017 (and along with it, people visiting shrines and heading back to their hometowns to ring in the New Year), plenty more holiday seasons await. Golden Week in late April/early May consists of a string of national holidays with plenty of events and festivals to go along with it. Summer holidays like Tanabata (Star Festival) and Obon (a Buddhist festival for honoring one’s ancestors) also see similar peaks in celebratory spirit. No matter the time of year, I’ll be sure to always look out for opportunities to enjoy and partake in these festive celebrations.